We have also developed several less commonly used paper and pencil neuropsychiatric instruments which are applied when appropriate. The Neppe Déjà Vu Questionnaires are other screening history instruments seldom used in clinical practice. However, the major value of this well validated instrument is to demonstrate how we cannot interpret symptoms not elicited in detail as the same. Using a phenomenological analysis, Neppe was able to demonstrate that the symptom of déjà vu, commonly regarded as symptomatic of temporal lobe epilepsy indeed had a very special phenomenologic quality in patients with temporal lobe epilepsy (Neppe, 1983A). This involves its association with post-ictal features such as sleepiness, headache and clouded consciousness and its link in time with these features. This association provides an excellent clue to the existence of temporal lobe epilepsy but déjà vu is a normal phenomenon occurring in 70 percent of the population and unless such phenomenological detail is obtained, patients' symptomatology may be misinterpreted (Neppe, 1983 A). Neppe has similarly done such a study with olfactory hallucinations (Neppe, 1983 B, 1984). A specific type of temporal lobe epilepsy olfactory hallucination could not be demonstrated although there were suggestive features. A major message, therefore, may be the relevance of adequately assessing in detail the symptomatology of patients. 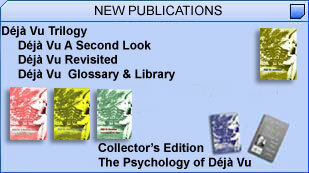 If déjà vu occurs, temporal lobe epileptic déjà vu must be specifically sought. Such detail may be as relevant as electroencephalographic monitoring (Neppe, 1983 A ). See The Psychology of Déjà Vu for further reading. See more on déjà vu.